This simple tutorial will show you how to make colorful magnetic clothespins to use on your fridge, or command center. It’s fun to let your creative side out and make the ordinary more extraordinary. When I saw these clothespins in Hobby Lobby, I had an idea to create lovely colorful magnetic clothespins by decoupaging the faces and adding a little magnetic tape. The process was really simple, and I can see all kinds of options for creating, as well as using these pretty little guys. I bet you have a nice collection of pretty napkins around, and they work great for this project. You can also use tissue paper or even something you printed from your computer. If you use a napkin, pull the backing sheet off, then hold the clothespin behind the image, to find the perfect place for your clothespin. Cut a generous amount of the napkin to cover the clothespin and glue it into place with Mod Podge. Use a piece of sandpaper, to rub against the edges, and remove any excess. Then coat the top with a generous amount of Mod Podge. This will dry clear and help protect the finish. You can continue this method for the back, or leave it plain. Then cut a strip of magnetic tape to place on the back. Washi tape is another fun idea for embellishing the clothespins. I found that it did not stick as well, but if you have one you really like, you could use some regular glue for permanence. They make great present toppers. 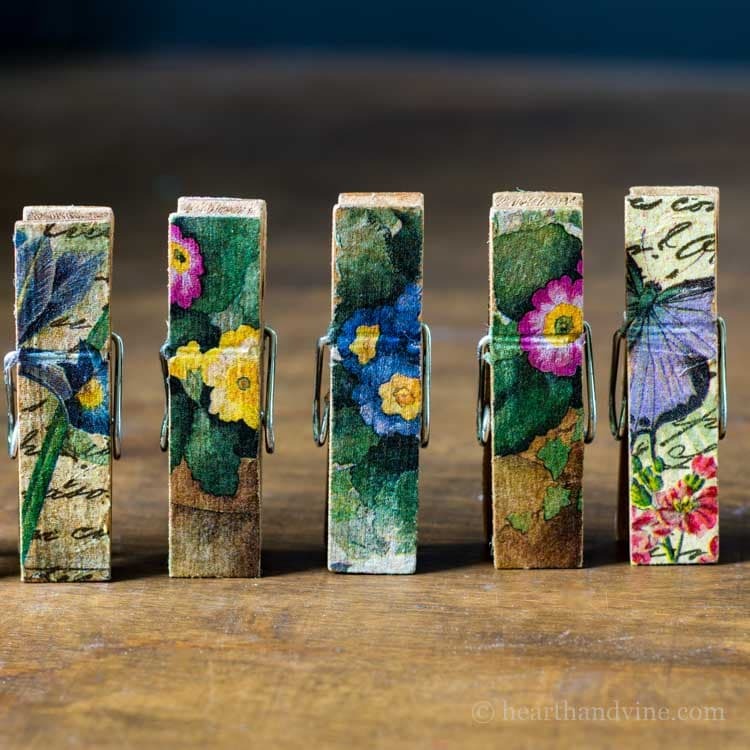 A simple and fun way to create a little beauty to an ordinary clothespin. These colorful magnetic clothespins are great for gifts and command centers. You can also skip the magnetic tape and use them as pretty chip clips. These are so pretty! I like using clothespins as chip clips, and these would be so cute! I like the idea of using them as magnets as well. Now I need some pretty napkins! I’m so glad you like the clothespins. They were fun to make. I’m always buying pretty napkins and then I don’t want to use them so this is a good way to be able to keep them around. Love them! So cute. Looks like I might even be able to do it. I’m so glad you like them! They are really fun and easy. Hi Patti, I LOVE these! They are sooo cute. I use clothespins for bag and chip clips. These would be so nice for that purpose. Thanks for the lovely comment. I like to keep them on the frig for easy access. It seems like every time I need one for chips or any bag, they have vanished from the junk drawer. lol It probably just means I need to clean out the junk drawer! Great idea I hang my clothes outside to dry and these would be so pretty instead of the plain wood. I like the idea of adding them to a package too. Another fun project and this one is easy, I’m finding my attention span prefers easier projects this time of year. I agree with you about the easy projects. There’s always so much to do, especially this time of year. The funny thing is I kept seeing these larger clothespins with in different styles in shops while we were on vacation. Of course they were on the expensive side and I had already written the post. Thanks, as always for your lovely comment. Why not have pretty clothes pins for the clothesline.